Setup Area: needs to be level area with nearby access to electrical outlet. We provide a small table to set machine. 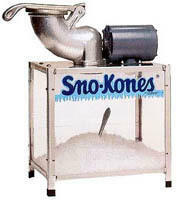 Beat the heat and rent a snow-kone machine for $50! We also provide a table to set the machine on, you provide the ice (regular bagged ice cubes). We suggest using Gold Medal syrups for best flavor, click here to order. $10 off your concession machine rental, when you order together with any inflatable! Enter code FUNFOODS at checkout!